Do your prospects or clients feel lost? Does your product/service hold the answer? Use these themed mailers to stand out! Our testing our found that the more tightly themed your mail sequence is, the more success you’ll have. Use these 3 pieces to cut the clutter and dramatically boost response. Shall We Send Out the Search Party? A few weeks ago we mailed you a FREE $20.00 American Retail Supply Gift Certificate because our records indicate it’s been too long since we’ve heard from you at American Retail Supply (formerly Thompson Merchandising & Supply). And, it even Doubles to $40.00 with your purchase of $200 or more, and Quadruples to $80 with your purchase of $500 or more)! 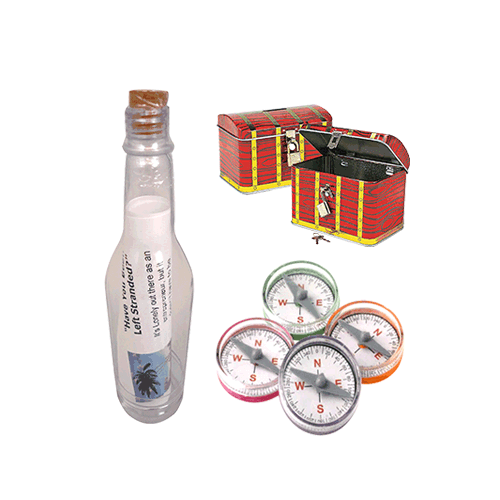 “Ahoy, Matey, Unearth the Hidden Treasure in Yer Direct Mail Campaigns And Ye Won’t Even Need a Map or Hornswaggle any Landlubbers to Find This Here Treausre Chest"
Pricing listed is per set of 3. For example,4 cases would get you 48 of EACH item, 12 cases would get you 192 of EACH item, etc.